When Movado combines its contemporary design codes with the legendary Museum model, the result was bound to be spectacular. But when, for the very first time, the brand places ceramics at the heart of a ladies’ timepiece, this approach opens up whole new vistas. It is all about chemistry and finding the right balance. Aesthetic purity first and foremost, interpreted here by a head to toe monochrome look. 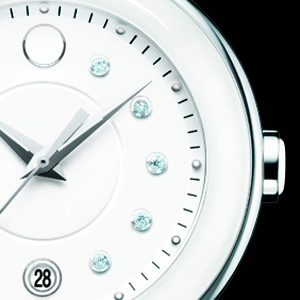 The dial is white, as it the ceramic bezel, and only the bracelet dares to display a delicate two-tone touch. The indications provided by the three hands and date are extremely readable, while applied diamond hourmarkers, the date at 6 o’clock and the emblematic dot at 12 o’clock enliven this decidedly “Bauhaus” style tableau. Its 36 mm-diameter ensures a sense of discretion. 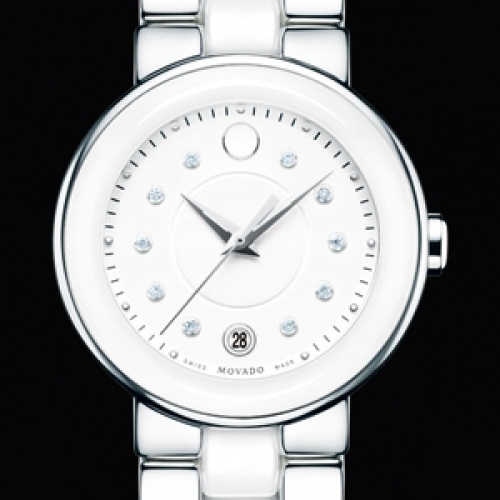 Nonetheless, this subtly harmonious appeal conceals exemplary robustness and reliability provided by the use of ceramics – an innovation offering a modern take on the Movado heritage while confirming its commitment to elegant and modern watchmaking.